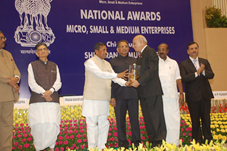 Bry-Air has won the prestigious National Award 2011 in Research & Development (Medium Enterprise), 3rd prize, which is organized by Ministry of Micro, Small & Medium Enterprises (MSME). There were total of 8 categories and 36 winners nationwide. The Award was presented to Mr. Deepak Pahwa by Sh. K. H. Muniyappa, Hon’ble Minister, MSME. 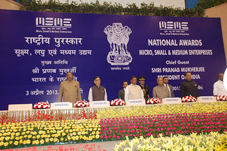 Also, the Awards ceremony was graced by Shri Pranab Mukherjee, President of India at Vigyan Bhawan, New Delhi. The Micro, Small and Medium Enterprises (MSMEs) in India have undergone a vast development in the last five decades. The Ministry of MSME recognized Bry-Air for its outstanding work in R&D.